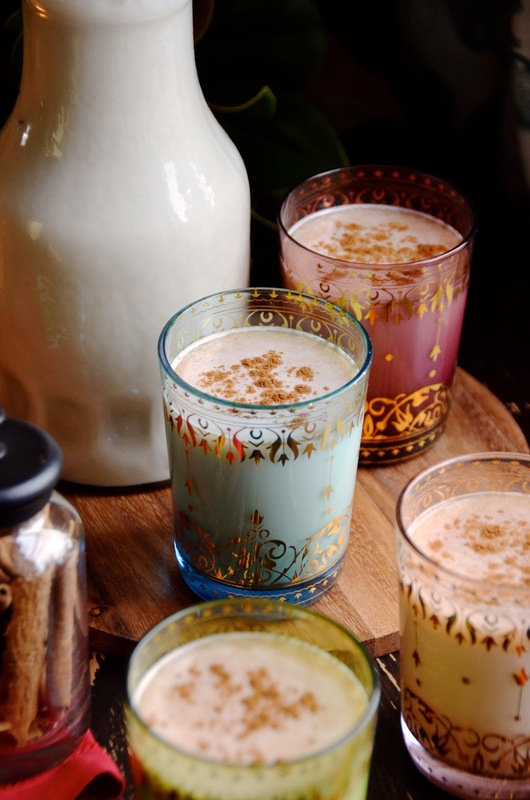 I've shared a few coquito recipes on this blog before, both for the classic coquito and fun variations like chocolate coquito and coffee coquito, but a request I get a lot is for a vegan or dairy-free coquito version so I finally got around to posting one for you! 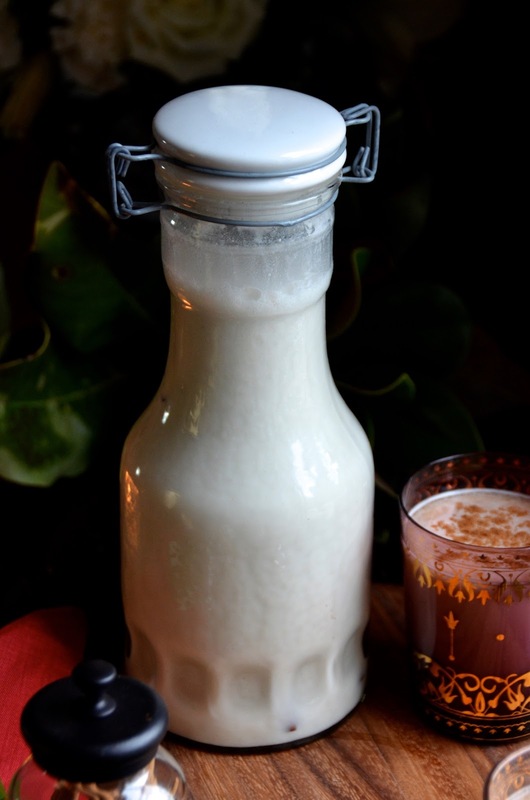 If you've never tried it, Puerto Rican coquito is a holiday coconut and rum beverage that is often described as "Puerto Rican egg nog." It's a drink that my family has made and served during the holidays my entire life, and I love that the appeal and popularity of it has been able to reach and touch so many others. The idea of non-Puerto Rican families enjoying coquito during the holidays makes me so happy! Classic coquito is made with a mixture of evaporated and condensed dairy milks, plus coconut cream and a few other ingredients. Some versions also include egg, though I prefer to omit it even in my non-vegan recipe. This dairy-free version uses full-fat coconut milk as the base, as well as soaked cashews to add creamy thickness without any dairy. This would be perfect for anyone with dairy allergies, lactose intolerance, or vegans. It also lasts a bit longer than the dairy and egg versions, which is another added benefit! Note that for the creamiest vegan coquito, you need to soak the cashews at least 6 hours so I recommend starting this recipe the night before you want to serve it. You just combine the cashews and water and let them sit, then drain and puree along with all the other ingredients. Then chill, serve, and enjoy!! Want more Puerto Rican holiday recipes? Check out The Puerto Rican Christmas Table--my ebook featuring 40+ Puerto Rican holiday recipes. The Puerto Rican version of egg nog is traditionally made with a mixture of evaporated and condensed dairy milks and sometimes egg yolks. This non-dairy version substitutes coconut milk and uses soaked cashews to add creamy thickness without any dairy. 1/4 cup granulated sugar (substitute coconut palm sugar, maple syrup, or raw brown sugar, if you prefer. You can also skip the additional sugar, or add at the end to your taste). Combine the cashews and the 4 cups of water and let soak at least 6 hours, or overnight. After soaking, drain the cashews and discard the soaking water. Add the soaked & drained cashews to a blender along with the coconut milk, cream of coconut, sugar (if using), vanilla, ground cinnamon (not the sticks), and salt. Puree 5 minutes, or until very smooth. If your blender is small, you may need to do this in batches. Place a fine mesh sieve over a large bowl or pitcher and pour the pureed mixture through the sieve to remove any larger nut pieces that didn’t fully blend. Discard any solids. Whisk in the rum. Divide into large glass bottles or jars, and add 1 cinnamon stick and 1/2 vanilla bean per bottle (this is optional, but a nice touch that helps the drink infuse with even more flavor). Seal and chill at least 2 hours before serving. Store in refrigerator and serve chilled with a sprinkle of cinnamon on top. Also wonderful served "on the rocks" if desired! Note that it will thicken and separate when cold so I recommend letting it sit on the counter for a couple minutes, then giving it a vigorous shake just before serving.